Can’t beat the price for what you get! Very sharp right from the start, it’s a great multi-purpose carbon steel knife, very functional drop point blade. From prepping camp food to cutting rope, I’d recommend for anyone’s pack. I've had this knife for a little over three months and it has become my go-to knife both on and off the trail. From opening and breaking down cardboard boxes, to cutting lengths of rope, and even cutting some pepperoni while car camping it has performed awesome! You can see the comparison of its total 8.5" length and the blade height when next to a steak knife. Multi-purpose is the best way that I've come to describe this. While it does not have a serrated edge, I have used it to cut pepperoni logs, cut up shirts into rags, cut back rose bushes, and 5mm rope (takes just two firm pushes to completely cut) for DIY projects. I was apprehensive at first after I purchased it due to the cheap cost and plastic sheath, but found myself wanting to use it for everything, even cutting open our mail. I was very surprised at how sharp this blade was from the very start and how sharp is has maintained. That was one of the reasons I decided to buy it and it hasn't let me down. I'd put it right up against any middle-end chef's knife. I have also maintained its edge using my Lansky Blademedic ceramic joint after cutting through some thick rose branches, though it hasn't really been necessary. The knife feels great in the hand. The curvature of the handle is unlike the steak knife. Slightly wider at the top (what is held in the crook of your palm, next to your thumb) and has that slight triangular design. ; more of an ergonomic grip per se. The grip is gummy, yet not overly so. The important factors for me when it comes to safety were two-fold: (1) how does it handle when wet and (2) how secure is the knife in the sheath. Since May it has been the wet weather. The grip is rubberized and does not feel too slick when it is wet or my had has been soaked. Note the tapered edge which is what secures the knife when sheathed, mentioned below. The hip clip is very stiff and tight against the waistline. Typically I hold it or pack it, not using the buckle much, but it is well made. Unless stressed, I don't see it breaking off any time soon. Keep in mind it is a thick plastic, so it is possible. 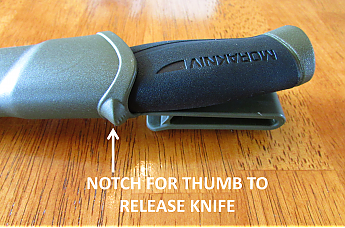 The plastic sheath holds the knife securely by its design, tapering on the sheath at the point where the knife handle begins. As I mentioned, I do not want any knife to loosen from its position when not needed. I have shaken the knife while it is the sheath (holding the sheath’s tipped-end) and it hasn’t budged yet.When putting this knife away, there is a click of the handle against the plastic when it is secure. One concern of mine is the longevity of this method. Instead of having any tie down, this is the only way to keep the knife in the sheath. 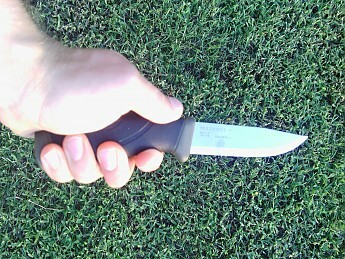 After time, if the handle end (where blade meets the grip) becomes worn, then the knife may be too loose in the sheath. If this were to happen it’ll be so long in the future, I’d probably just buy another $13 knife or make a DIY method to secure it. With this being made from carbon steel instead of stainless steel or having a protecting coating, this knife can be susceptible to rust or tarnishing. Something I’ve read in the past was to oil it down with mineral oil. Personally I’ve used synthetic motor oil one time so far, only a few drops are needed. This came from reading about someone who used synthetic motor oil for the katanas he makes and sells for several grand; if it’s good enough for him, it’ll be good enough for me! I'd like to see how this blade or spine does with striking a flint. Not having one at the moment, I was unable to test this capability. I'm not a guy who has a ton of experience with knives. I've had pocket knives a-plenty and a handful of 4-6 inch blade knives. It also comes in several different colors from black, green, and even bright orange. If the carbon steel isn't an option for you, there are also options of stainless steel and carbon steel with an anti-corrosive layer. 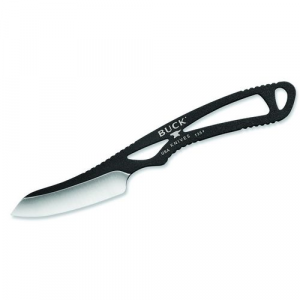 For $13, you can't go wrong using this for any type of outdoor activity or having as a household multipurpose knife. Having never heard of it until a few months ago, I'll recommend it from now on. Another very helpful review, thanks for sharing it, Daniel! Another great review! Thanks, Daniel. An extremely sharp, durable, carbon steel knife for $15?? Yes, please! Simply put, it is durable, sharp, easy to hold, and light weight. It has become my trusty companion — no pun intended — on many hikes and camping adventures. The fixed blade is a little over 4 inches long (spine is 2.5mm, or .10in) with a drop point edge and straight from the factory it is really sharp. I was able to cut paper with only the weight of the knife by sliding it back and forth on the paper's edge. With some bigger stuff, it can easily cut through quarter inch sticks. The carbon steel is really strong. There's no give to it, and I've been able to use it for batoning thicker branches and such. I don't use it for that, but if I had to, I know I could. Even the edge of the blade is durable. When I first got it, I was sitting by a campfire preparing a stick to roast some sausage and hot dogs. Used to a knife that isn't as sharp, I cut straight through the stick and hit the sharp edge right across a rock. When I looked at the blade, there was just one small ding in it, which I was able to get out later. There is nothing super special about the sheath, but there really isn't anything bad about it either. It's one piece of molded plastic, and it's quite durable. The knife snaps right in, and it holds the knife well. 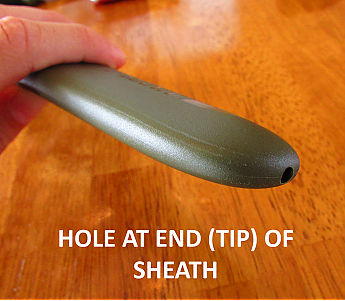 There is a small hole in the sheath where the point of the knife is. I'm guessing that's to allow water do drain if it gets wet. There are really only two things that disappointed me about the knife. One is that it's not a full tang knife. It's a 3/4 tang knife, which means that the steel does not entirely part of the handle. That usually means it's less durable, but I've had no durability issues yet. The biggest letdown for me about this knife is that when I struck the spine against my flint, it did not create sparks. I fixed that problem by filing down part of the spine to make a sharp enough edge to create sparks. So far this knife has been well worth the money. The Swedish-made carbon steel is sturdy and very sharp. The rubber grip feels really good in my hands, and I clip the sheath either to my backpack or my belt. It's light enough that I don't feel it there, and I was able to make it create sparks. For $15 dollars, you can do just about anything with it and not feel guilty about ruining it, and you can use it for lots of different jobs. My dad likes to use his for basic wood working and one of my buddies takes his fishing. I would highly recommend this knife. I've yet to find a better quality-for-the-price ratio. And they make great gifts! Great review, Adam! I actually got one last month and I like it so far. Haven't tried to use it with a flint, but the filing down is good to know. Thanks for the comment! Yeah, the spine was a bit rounded and not rough enough to make sparks when dragged across a flint. Filing it down made the edge more square, and I now get lots of sparks. I agree, this is a great 'bang for the buck' knife. They are sharp, durable, and fit the hand well. The best deal around. This knife was rated as one of the best outdoor knives to have by either Field and Stream or Outdoor Life (I forget which one). I have bought a few. I am missing one (not sure where I left it) and I'm not crying because I'm only out $15.00. I've never missed the full tang so, for me, not a big deal. Nice review! Great knives! I've got 2 Companions, 1 Firesteel and 1 filet and I absolutely love them. Great camp and all around duty knives. I've also got a short blade crafting knife for cutting Amsteel and the like and it works great too. Never miss the full tang and the handle does indeed feel great in the hand. Great review Adam! I have this knife and love it. If you take the knife and put it in a vice so that the top edge is sticking up above the vice you can use a file to file the top edge to be flat and not rounded. Then wrap some sandpaper around the file and smooth it off and it will throw sparks with a firesteel. You just need a 90 degree edge on top to throw sparks. As it is you can stiil use the blade side but it will dull the blade. 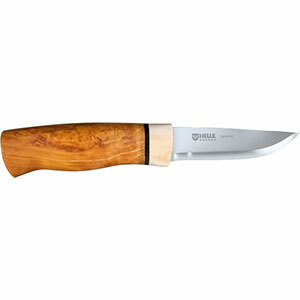 Perfect for anyone who needs a sharp fixed blade knife for basic camp kitchen and basic bushcraft chores. Backpackers will especially enjoy how lightweight this knife is. After collecting all manner of knives I have fallen in love with the Mora for basic outdoor chores. The 4.1" carbon blade is a very usefull size without being too short for many tasks or too long and too awkward to carry. Folding knives have their place but a fixed blade will always be easier to deploy and use. A fixed blade knife does not depend on locking mechanisms that tend to loosen or even fail with repeated use. Besides being a great blade, the Companion also offers a very ergonomic, hand filling, non-slip grip which greatly increases the comfort and the safety level when using this knife. Cold, wet hands and a slippery knife handle are a bad combination. The plastic sheath is a real surprise in that it securly holds the knife but allows easy one handed deployment and one handed holstering. The self locking sheath eliminates fumbling with snaps and straps. The heavy duty belt clip accomodates belts up to 1 3/4" wide. The belt clip also atttaches easily to pack webbing and loops. The back of the 4.1" blade is slightly rounded and will not work well with a fire steel. 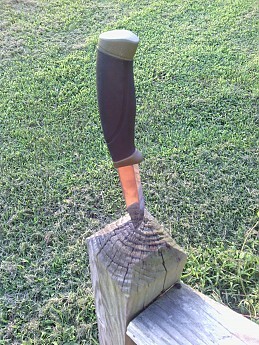 I used a fine grit belt sander to create a sharp edge on the back side of the blade. It didn't take much, go slow. Carbon steel is easier to sharpen to a fine edge in the field than a stainless steel blade. Carbon steel does stain and will rust if neglected. Mine was all gooped up with pine sap. After cleaning the blade I boiled some apple cider vinegar and let the blade rest vertically in a glass to soak for 15 minutes in the hot vinegar. Rinse well in water and polish the blade with soft scrub or brasso to get an even finish. Reboil the apple cider vinegar and repeat this process two more times. The result is a a darkened non-reflective blade with a gun metal finish that will resist staining. Especially for backpackers, this is the one knife you need above all others in my opinion. Thanks for the Morakniv review, John. It's a well regarded knife for the price. Amazing trick with the vinegar! I am excited to try it on my own Mora. I have 3 of them (actually 2 now). I just lost my favorite one this past weekend. It fell into a raging river while I was photoing something at the edge. It was the robust version of yours. Awesome knives. 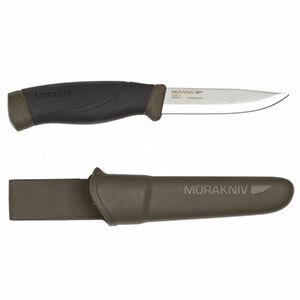 The Morakniv Companion is an uncompromising work knife that is an excellent outdoor knife at an extraordinary price. Lightweight, easy to sharpen, and tough. The Morakniv Compaion with carbon steel blade is, in my opinion, the best value you can find for a basic work, camp, or kitchen knife. In addition, you can use it for things for which it wasn't designed. I'm not going over the specs because they've been covered in many other reviews. I bought the Companion new about three or four years ago based on Internet reviews of common outdoor and bushcraft knives. At this point, I must attempt to clear up a very common and somewhat dangerous misconception. 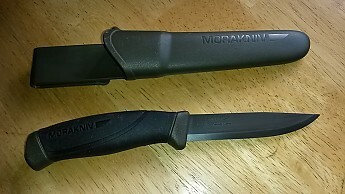 The Morakniv Companion is NOT a bushcraft knife! The companion is a WORK knife that's used by craftsmen in Sweden. It is not designed to baton firewood, to cut down saplings, to hammer, or to be driven into a tree and used as a step. My review of the knife. My Companion arrived very sharp, and needed only stropping (I use a leather strop with jewelers rouge) to create a razor-sharp edge that I tested by shaving a patch of hair on my arm. The scandi grind on the edge makes it very easy to maintain the edge. The three-quarter length tang doesn't bother me a bit. It keeps the knife lighter. I don't understand the reviews that list the tang as a con, but don't say what issues they had with it. The blade will discolor and rust if you don't clean it after using the knife to cut anything wet or corrosive (such as fish, meat, wet veggies, etc) just like your expensive carbon-steel chef's knives. One reviewer provided a simple, old fashioned method of "pre rusting" the blade that makes the knife much less prone to rusting. Whether or not you use that method, I would recommend a light coat of a mineral or vegetable oil if there is ANY possibility of using the knife for any edible. I personally would never use a petroleum based oil on any knife that could be used with food. Use a very fine ceramic or natural stone or a leather strop (such as the inside of a leather belt) to give the edge a few strokes to hone the edge after use. I don't recommend using a steel. I filed the spine of the blade square (90 degrees to the blade) near the handle to use with a fire steel. It throws a great shower of sparks with a Light My Fire steel. I also used paracord to tie two fishermen's knots to create an adjustable loop to allow me to use it as a neck knife when fishing. Since I've had the Companion for only a few years, I anticipate that it will last longer than I will. I have had a Mora Frost No.1 knife (2 1/2 inch laminated carbon-steel blade) for at least 54 years. The blade got bent at some point, I straightened it in a vice, honed it, and shaved hair on my arm ( my family and friends can always tell when I've been touching up an edge). It had only minor discolored spots even though I didn't oil it in the 54 years. If you use your Companion as was intended, it should last a lifetime. 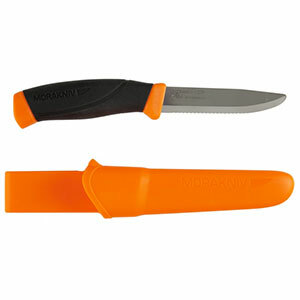 Morakniv manufactures a huge line of work and speciality knives. if you want a stronger knife, consider a Companion Heavy. If you want a multipurpose knife, consider a Light-My-Fire knife (joint Morakniv and Light-My-Fire). I have a Light-My-Fire knife in my car survival kit, and gave one each to my wife and son for their kits. If you want corrosion resistance, you can get the Companion Stainless Steel, or the Light-My-Fire. Both have stain resistant steel (nothing is truly stainless), and the Light-My-Fire has a modified scandi grind. 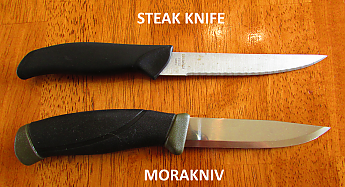 All in all, you can't beat a Morakniv knife for anything near the price. Nice review of your knife, Old-time Backpacker! If you have some pictures of yours, those would be great to see in your review too. p.s. I'd love to read a review of your Mora Frost No.1 knife too. Amazing knife. Razor sharp, incredibly tough, comfortable grip, and very affordable. I bought this knife to see what all the fuss was about with Mora knifes. I already owned other high quality knives, both folding and fixed blade. I mostly use this knife as an all-around tool for backcountry backpacking. The knife is very well designed. The shape and materials of the handle make it comfortable to use and provide a very secure grip. This was my first knife with a Scandinavian grind, and I quickly fell in love with it for its sturdiness and ease of sharpening. The blade was shaving sharp out of the box, and coud hold an even sharper edge after sharpening. After a good sharpening it can easily push cut a thin piece of paper. The scandi grind stands up incredibly well to abuse. I've used it for batoning extremely hard mesquite wood and it does it with is. It also carries out more detailed bushcrafting tasks with relative ease. I frequently let other people use this knife and most of them are not careful at all. This knife has been used in all the wrong ways and has taken those beatings like a champ. At the time of this review, it hasn't been sharpened in months and the edge is slightly chipped from friends using it against rocks. The knife has also been used to pry pieces of hardwood to start fires, which made me cringe the first time a friend did it, but the blade and handle are still as solid as day one, and even after such neglect, the blade still cuts paper with more ease than expected. Many people worry about it not being a full tang knife, but I now know very well that this knife is a serious tool and will stand up to anything you can throw at it in a real-world scenario. My typical usage involves long backcountry expeditions where I often find myself far away from any other humans for several days, and this is one of those tools I know I can always count on. Oh, and don't even get me started on the price. It's amazing that you can get such a great knife for so cheap. Welcome to Trailspace, Roberto, and thanks for the helpful reviews! If you have some pictures of your Morakniv, those would be great to see in your review. I have had a ton of Mora knives over the years and probably some other Scandinavian makers as well. The shape and size of the blade is culturally determined and virtually identical with every knife coming out of Scandia. They can be had in carbon steel, stainless steel and san mai (hard carbon steel in the middle of the blade, layered on each side with iron for durability). They are the price point for a small-ish sheath knife. Quality is excellent, they are cheap enough to lose or get one stolen on occasion. I have a blade or two from Mora that I got from a friend. When I figure a handle material that can get the weight down to a back-packable level, I may start carrying it. This lightweight knife will be the only one needed. Having a extensive collection of knives and katanas I've come to find that high carbon steel knives are my favorite. When compared to stainless steels, carbon is softer, but tougher. That means that it's easier to sharpen and less likely to chip, as it's not as brittle. It will rust if left wet, but that's not necessarily bad, as long as it's not kept wet to the point it eats away steel. The Companion comes very sharp and highly polished and all it takes to maintain the knife and edge is wipe it dry before re-sheathing it. Eventually, it will take on a darkened patina just like I remember grandpa's pocket knife had. That patina can be created on a new carbon steel knife simply by wrapping a vinegar soaked rag around it for an hour or so. That patina is oxidation that will act as a protection against the more destructive rust and it looks rather appealing to the eye. If you must retain the shine then I suggest a tube of Flitz. It will remove rust and oxidation from any metal and when hand polish with a rag will look like it just came from a jeweler's buffing wheel. It also leaves a protective coating that's food safe. This gem only weighs 135.7 grams w/ case at the retail cost of $13. By far the best value for a trail knife no one should be without. I really didn't know what to expect, but was and continue to be very impressed! I read quite a bit about this brand of knife, but was still skeptical because of the low cost. I finally bought one and have been becoming more impressed with it at every use. This knife is lighter than any knife I've taken hiking, but is as tough as any other. 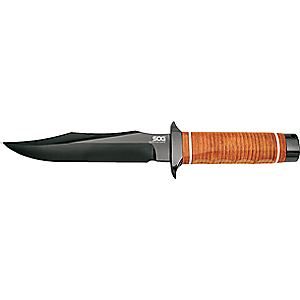 This has got to be the best value for any hiking/hunting/bushcraft knife on the market. It's made every task I've taken on easier. These would include: fine whittling, feather sticks, splitting wood (yes, I battoned with it), notching, etc. Basically if you want to cut something it will do it and usually with ease. After months of use (and abuse for those apposed to battoning) I finally decided it might need some sharpening. The Scandinavian grind on the blade made that extremely easy. After a few minutes an edge as good or better than original was on the blade. This has become my go-to knife when I'm outdoors (even indoors, but that's another topic). I would buy and have bought more of these knives. Awesome inexpensive, lightweight knife for hiking. Awesome inexpensive, lightweight knife for hiking. Holds a good edge and is a great camp knife. 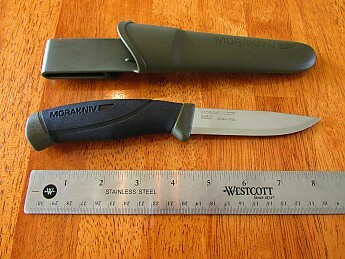 The Mora is a great knife for hiking. I used to carry around a knife capable of being struck with a rock through a tree that weighs several pounds. I had carried it 15 years and never needed the sturdiness it provided. The Mora Companion does all the cutting of twine, meat, or whatever needs doing flawlessly. I had a buddy pry with his and snap the tip. But at under $20 it's fine to break a tip or lose it. I do feel that the knife is very blade heavy due to trying to cut weight. It's going to be more weight than a little neck knife, but I want a more useable sized knife. I won't ever go back to a heavy knife.